At the foot of the Ortega Mountains on the flank of Cleveland National Forest, the 3,300-acre Lake Elsinore is one of Southern California's more spectacular natural wonders. It is also the region's only large natural lake. The city of the same name on its shores was incorporated in 1888 through the efforts of financier Franklin H. Heald. His partner, D. M. Graham, fancifully wrote, "We can imagine no more enchanting picture than Elsinore will present when the taste and energy of the settlers shall have made it a valley of fruit and flowers in the midst of which the lake shall lie like a priceless gem." Named after the castle in Shakespeare's Hamlet, the lake and city proved to be a stopover spot for hunters and ranchers, eventually vacationers, and then water and motor sports aficionados. Today Lake Elsinore has a thriving population of about 30,000 year-round residents in the southwestern corner of Riverside County. 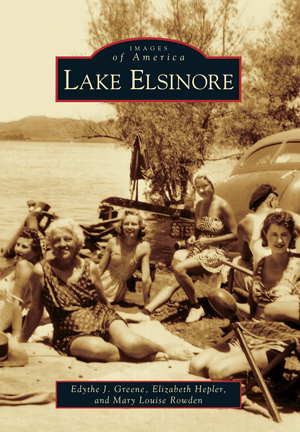 To portray this area's unique formative years, coauthors Edythe J. Greene, Elizabeth Hepler, and Mary Louise Rowden drew on the collections of the Historical Museum of Lake Elsinore, the City of Lake Elsinore, and its library. Photographs from the private albums of local residents help to illustrate the more recent decades of this enduring priceless gem.